When designing your home, striking a balance between form and function can be a challenge. Making your living space aesthetically pleasing and purposeful at the same time requires careful thinking and plenty of designing talent. How do you bridge the gap between interior design and home automation solutions? One of the greatest challenges in any design project is the integration of a media center at home. As the focal point of many living spaces, designing the media center becomes one big dilemma since most electronics do not blend well with the existing interior design. The television, for instance, is one modern contraption that most homeowners can’t live without. Although modern TVs have morphed from bulky eyesores to slender machines, they still remain to be unsightly when not in use. Hiring a home automation contractor to take care of that predicament may work well, but for people who are hankering for a tasteful and clever way of integrating technology into the home, Seura is the only answer. Seura is a name synonymous with modern and sophisticated television designs. A brand hatched in a Wisconsin garage workshop, Seura redefines home entertainment with its unique and top-of-the-line products. Seura specializes in televisions that double as art—not just another piece of technology that are blots in the interior design landscape. The idea behind the brand is to build highly customizable products to meet its clients’ discerning taste. As a luxury indoor and outdoor television brand, Seura is popularly known for its weather-proof and vanishing televisions. The company also manufactures lighted mirrors for both its residential and commercial clienteles. Through the use of proprietary technology, Seura was able to create vanishing televisions that are sure to amaze even the most hard-to-please shoppers. When turned on, Seura’s vanishing televisions provide access to the usual news and entertainment channels. While that seems like no special feature for a television, the magic happens once the TV is turned off. Thanks to its superior mirror technology, Seura’s vanishing TVs “disappear” with a touch of a remote control button. Seura uses specially formulated glass coatings to seamlessly conceal the television when not in use. Who says you can only enjoy watching TV shows when indoors? 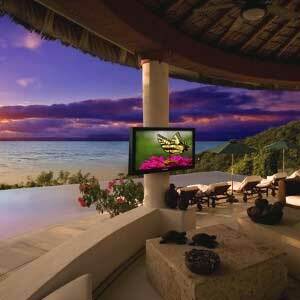 Seura made outdoor entertainment possible with its weather-proof Storm outdoor television design. Whether you’re soaking up the sun or tending on the grill, Seura’s outdoor TVs allows you to enjoy two things at the same time—al fresco. With its tough metal construction, the Storm outdoor television can take on whatever nature throws on its way. This thoroughly sealed television blocks out environmental contaminants, while giving you crystal-clear images on your TV screen. Elegant in style yet rugged in structure, the Storm outdoor television can withstand extremely high and low temperatures. 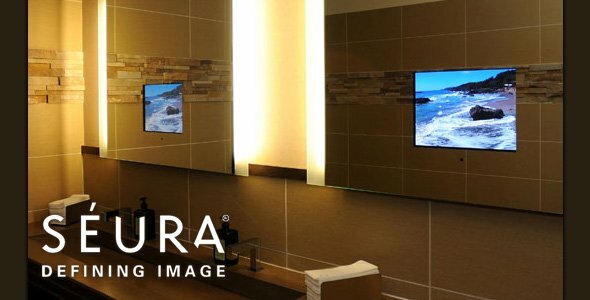 While Seura is best known for its line of state-of-the-art televisions, the brand is also sought after for its light mirror displays. Undeniably stylish and radiant, Seura’s lighted mirrors offer more than just a reflection of what’s inside your home. The lighted mirrors from Seura’s Lumination Collection feature a variety of lighting patterns to suit everyone’s taste. Whether you are looking for ambient or focal lighting, you can rest assured that you’ll get the proper volume of light on your mirrors. Seura is more than just a brand or as concept—it is a way of life. As proven by its line of elegant televisions and other mirrors, you don’t need to compromise style for function.